Those observing the Trump juggernaut with slack-jawed wonder from the sidelines might be interested in an insightful article today in the Washington Post, in which David Ignatius examines why Trump’s supporters appear impervious to criticisms of bizarre claims, U-turns, hypocrisy and complete absence of any credible policy. For those of us engaged in communicating science, this phenomenon holds some fascinating lessons. This flags some important lessons for influencers. People don’t like their preconceived ideas being challenged. We form a view of the world which feels intuitively right and when that is under threat, we close down. And there’s the issue of what Jude Capper called ‘bad news bias’ when she was researching how best to communicate scientific facts to the public. It’s the assumption that a negative assertion is more important than a positive one. Indeed, one negative piece of information is sufficient to neutralise five pieces of positive information. Hence Trump painting a ‘dark picture of a violent, frightening America’ becomes irresistibly attractive to his followers. So how do we counter these untruths which nevertheless ‘feel’ intuitively right to people we want to influence? – we will resist abandoning a false belief unless we are given a compelling alternative explanation – remember, nature abhors a vacuum! Furthermore, basic media training already tells us not to reinforce negatives with repetition. And like Aesop’s fable of the North Wind and the Sun, gentle persuasion often works better than forceful arguments. Lastly, when all else fails, Ignatius identifies one last tactic – leave well alone. He highlights what seems to be most hurting Trump in the polls at the moment: ‘self-destructive comments that trouble even his most passionate supporters’. He adds that ‘attempts to aggressively “correct” his remaining fans may only deepen their attachment’. Sometimes, the best response is no response. 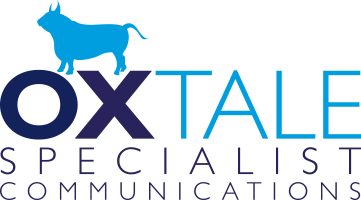 3 lessons pr can learn from ‘team trump’? An interesting article has popped up in PR Week about the things PR professionals could learn from ‘Team Trump’. Despite the lack of previous experience in politics, his PR manager Hope Hicks (previously worked for Ralph Lauren on fashion PR and modelling) is doing a remarkable job with what must be quite tough material! New guidelines published yesterday by Public Health England have almost halved the recommendation for our daily intake of dairy, cutting it from 15% of the diet to just 8%. This has baffled the dairy industry – and not just because PHE seems convinced we will gain the calcium we need from plant-based alternatives. The more confusing aspect is there seems to have been both little warning about this bombshell and scant information about the methodology used. A quick glance at the British Dietetic Association’s calcium factsheet tells us that not only are dairy products a fabulous source of calcium, but if you want to get calcium from elsewhere, you pretty much have to eat oily fish including the bones, mounds of leafy green vegetables, or calcium-fortified products such as soya, cereal or nut drinks; not foods I can imagine high-risk groups such as teenage girls going a bundle on. And do we really want to be consuming fortified products that need to be artificially sweetened – especially in light of a new clamp down on sugar in soft drinks? But overall, the most baffling aspect of this whole announcement is the lack of engagement with the industry as these recommendations were being developed. 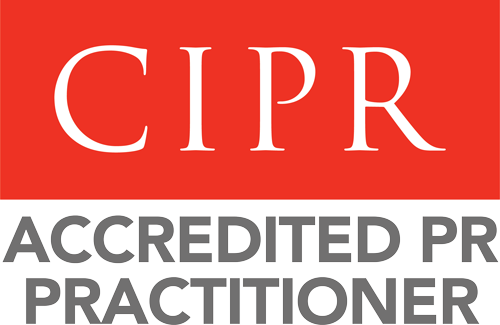 I can understand the need to remain impartial and credible, but engaging with the industry, being transparent about methodology and addressing challenges respectfully are all part of building a robust position. PHE appears to have done none of these. 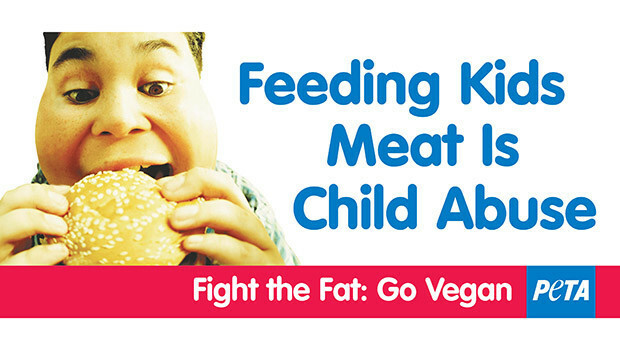 Does GBK cross a line with meat ads? 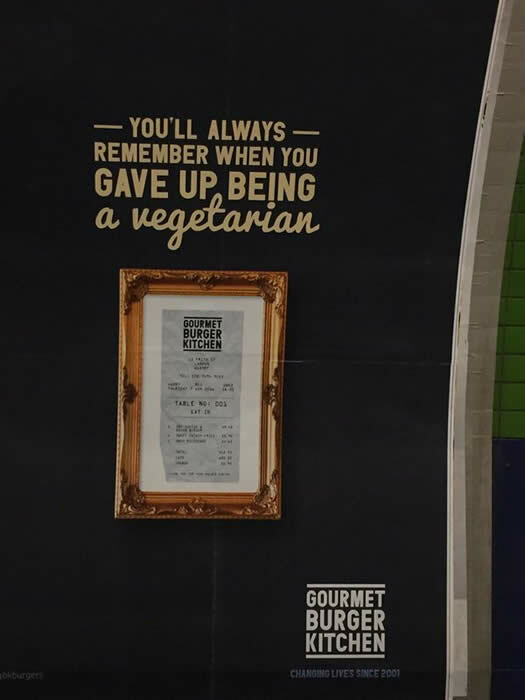 Gourmet Burger Kitchen’s new, provocative advertising campaign is certainly getting people talking – but in the right way? 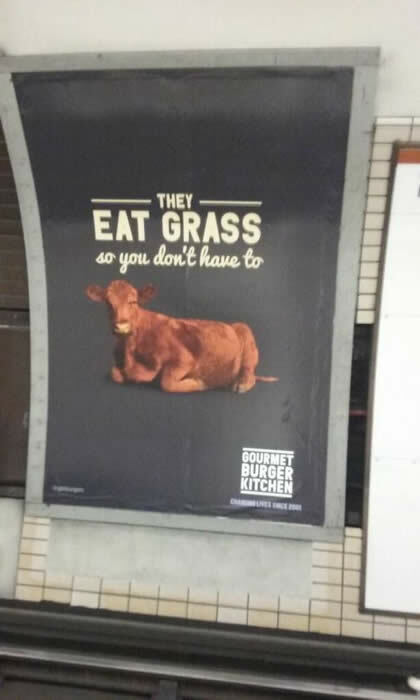 The ads, which have appeared in the London underground over the weekend, appear to be aimed at celebrating meat-eating (or specifically, Gourmet Burger Kitchen burger-eating). The predictable response from a number of vegan and vegetarians on social media has been shock and disgust, with accusations that GBK is ‘shaming’ them. There’s plenty of advertising out there either promoting meat, or advocating a vegan or vegetarian lifestyle, that is totally focused on taste and enjoyment without having a pop at anyone else. But where advertising media does take a swipe at others’ views, it does tend to be the non-meat eaters having a go at those who enjoy their steaks or bacon baps. 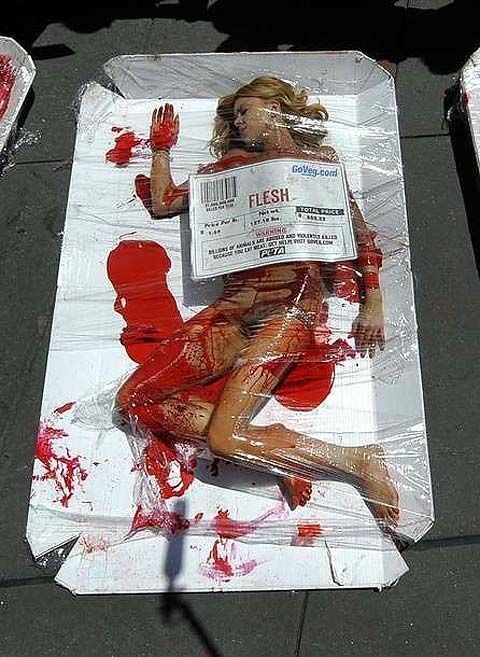 In turn, those who eat no meat because of their ethical beliefs claim they are subjected daily to images promoting products they abhor. At the last count (Mintel, 2014), 12% of adults are now following a vegetarian or vegan diet in the UK and this rises to 20% among 16-24 year olds. The research also reveals that almost half (48%) of Brits see meat-free products as environmentally friendly and 52% as healthy. 18% of us also claim to eat more non-meat sources of protein and 13% say they would be interested in buying products from the supermarket with, eg 50% red meat and 50% vegetable protein. 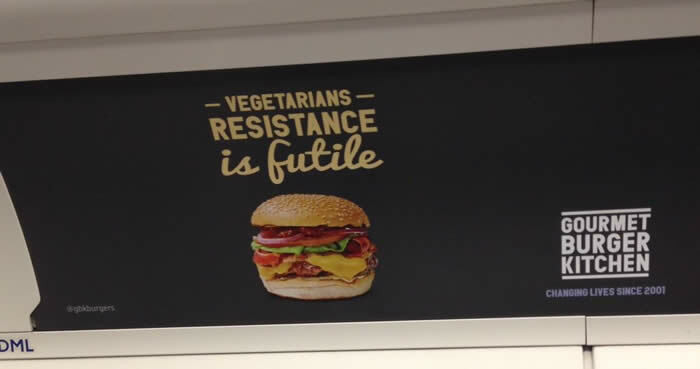 So back to the GBK adverts, on one hand I applaud the gutsy attempt to embrace our meat-eating inner selves and the lack of apology for where meat comes from, but on the other, given these demographic changes in diet, what is GBK hoping to achieve? If it’s to lure committed meat eaters away from other burger joints by making them feel good about their preferences, then possibly…but even some in this group might find the advert showing a beef animal in poor taste. If it’s to lure marginal vegetarians and vegans to a life of meat eating, then it’s undoubtedly an own goal. If GBK simple want to be talked about, then they are already achieving this. But on balance, for the meat industry as a whole, I don’t think it’s a win. Two wrongs don’t make a right, and being seen as poking fun at those who choose not to eat meat won’t improve the debate. Neither will a humorous take on the cow’s own diet, which some will insist is disrespectful. 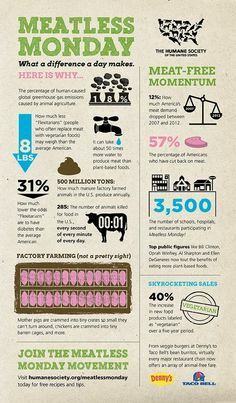 In these times, farming must be judged as respectful to animals, and eating meat as a supportable choice. GBK’s ads might end up generating lots of brand awareness (positive or negative), but I don’t believe they’ll help the long term health of the UK beef industry. This year, both Oxford Farming Conferences – the ‘real’ (Oxford Farming Conference) and the Real (Oxford Real Farming Conference) – claim to be sell-outs. Good news, but will they (or should they) find common ground and work more closely together? At the moment, they cover largely different topics. The OFC tends to focus on politics, European policy, interest rates, business and innovation, the ORFC on technical ways in which farmers can tackle growing challenges like degradation of soils, environmental impact and food waste. OFC sessions are characterised by professionalism, big business, big hitters, seriously big concepts, and the trapping of a world-scale production with mainstream media, suits, lights, whistles and bells. Conversely, the ORFC denotes accessibility, informality, technical wisdom and social enterprise. While the OFC – possibly justifiably – can attract criticism of being dominated by white male professionals largely in corporate agriculture or the industries allied to farming rather than farming itself, the ORFC can be focused on an anti-capitalist agenda, with – ironically – some quite closed minds (judging by the booing when some subjects or organisations are raised) and the notable absence of economics in its sustainability arguments. Either way, they both deliver something of value. Both cover important areas. And personally, I would like to see them move closer together. The question is, will they? Bizarrely, I can see the ‘status quo’ – the OFC – being more willing to move closer to ORFC than vice versa. OFC realises times are changing, but the whole brand of the ORFC thrives on being anti-establishment and being ‘on the outside’. So the question will be whether the ORFC wants to remain an outspoken critic ploughing its own furrow, or whether it wants to try and create real change by working with the OFC.